DERIVATION: from the Latin australis for southern. At a recent marine mammal conference, it was demonstrated how the use of technology is enhancing whale research. During a 6-week-period, a right whale mother and her calf were documented 2 times in the Bay of Fundy. In years past, it would have been assumed that they had remained in the bay for that time period. Since the mother was tagged and the pair tracked by satellite, researchers discovered that the twosome had not remained in the Bay of Fundy, but instead had traveled 2,500 miles. It is speculated that the reason for this enormous journey is that the mother is making a parental investment and showing her calf feeding grounds. The breeding mothers, for unknown reasons, have different feeding ground imprints. If these mothers were killed, there would be a cultural extinction of that right whale feeding ground. While the Southern population of whales is growing, the Northern population remains at 350. However, not all of these 350 animals are breeding. At the same conference, Dr. Charles "Stormy" Mayo said that the scientific community cannot wait until every item of a study has been analyzed. Scientists must take an active role with regard to the species they are studying. He was referring to Boston's plan to send sewage to Stellwagen Banks, a critical whale feeding ground. Inconclusive studies have been done to determine how much food a right whale needs and how sewage will affect copepods (mainstay of their diet). Dr. Mayo warned that the need for answers is immediate and desperate. Scientists speculate sewage will have a significant impact on whale feeding grounds. 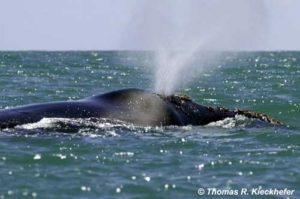 Feeding right whales depend on grouping of copepods. Sewage could block sunlight diminishing copepods' food source (plankton) and cause copepods to scatter. If they scatter, the whales will starve. In the case of right whales, any errors or accidents could mean extinction.